As you may remember, the Storm family moved to California last fall for Elodie’s amazing JSK Fellowship at Stanford University. They’ve been learning a lot and getting to know the innovative communities out there, and we’re excited to share some events where you can catch Brian on the West Coast. On April 26 join Lynn Johnson and Brian for a conversation on the selfie and its place in an increasingly interconnected world on at the Mitchell Park Community Center in Palo Alto. The talk will reflect on the question: how does our selfie obsession connect us with one another as we are challenged to hold our ground in empathy, tolerance, and inclusion? This talk is part of the Palto Alto Photo Gallery Lecture Series, an organization that aims to foster conversations in visual storytelling. Learn more here. And if you want to learn more about why Lynn Johnson is an amazing person to learn from, watch this film we produced about her work, telling stories of women from around the world. On May 1, in conjunction with Filmmaker Success, Brian will be presenting on digital storytelling and the cinematic narrative. 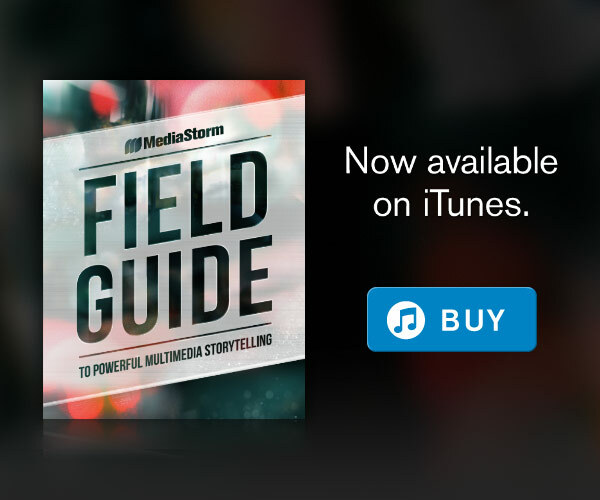 Citing work by MediaStorm, Storm will emphasize how storytelling continues to evolve as a result of technological innovations and an expanding media universe. The digital age gives filmmakers, documentary photographers and photojournalists extraordinary and unprecedented new ways to tell stories. Storm will also give an overview as to smart business strategies to help freelance and small business owners alike in an increasingly evolving media landscape. The event will take place at the San Francisco Public Library, North Beach Branch. Learn more here. And finally, he’ll be teaching our One Day Masterclass on May 5 at Stanford University. The MediaStorm One Day Master Class provides a general, yet precise, overview of documentary video and multimedia storytelling approaches. MediaStorm founder Brian Storm will walk you through specific examples, and share his business experience, as well as proven tips to improve your interviewing, shooting and editing techniques. Although this is not a hands-on workshop, active discussion is both encouraged and expected from all participants. Theory is backed up by real world examples using MediaStorm’s award winning work. The One Day Master Class is designed for anyone interested in learning about the ins and outs of producing and distributing documentary and multimedia content. To apply, click here.